Tungsten heavy alloy can use as tungsten alloy weight for sport equipment,such as:tungsten sinkers, WHA counterweight for golf and dart parts. Tungsten alloy weight is an ideal, environmentally friendly alternative to lead weights, which are toxic and increasingly being labeled an environmental hazard. Tungsten alloy weight is harder than steel and extremely dense, tungsten being on average 30 percent smaller than its lead counterpart. Tungsten weights are smaller than conventional weights, create twice the sound of lead weights and maintain their shape for longer. In addition, during the last stages of assembly, weights may be required to adjust the final balance of the aircraft. 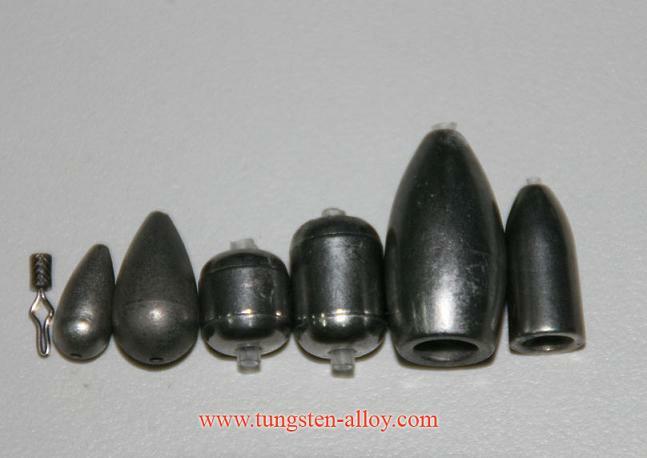 Tungsten heavy alloy is the wise choice when working in a restricted space because of its high mass/size ratio. As materials with high density can be located further from the pivot point, whilst achieving the same moment so that tungsten heavy alloy can also offer the advantage of actually reducing the total trim weight mass. If you have any interest in tungsten alloy weight, please feel free to email us: sales@chinatungsten.com sales@chinatungsten.com or call us by: 0086 592 512 9696, 0086 592 512 9595. We are at your service.